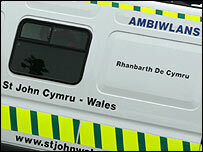 St John Ambulance has said it is worried first aid lessons may be about to disappear from Welsh schools. The charity claims a review of personal and social education (PSE) may downgrade first aid, and mean some pupils would not learn basic skills. The Labour assembly government said first aid is not under threat, and would remain part of the framework. Recommendations on changing lessons will be considered after the assembly election. The proposals would mean first aid not being a recommended part of learning at key stage four, and a suggested subject at key stage two and three. According to St John schools officer Sarah Thomas, that could mean some pupils not getting any training at all. "First aid is an activity that all schools can get pupils involved in, even at any ability, and we believe all school children should leave with these skills," she said. "To get it mandatory somewhere means that more children in Wales will learn these skills and possibly save more lives." Croesyceiliog Comprehensive in Torfaen was recently awarded the St John Ambulance school of the year prize. Year eight pupil Owen Van Demeer said the skills they have learnt have been valuable. "I learnt to treat heart attacks, as well as burns, fractures, scalds, scratches and cuts - stuff like that," he said. A fellow year eight pupil, Lauren Fox, said it was a practical part of their education. She added: "If you've got a burn you can treat it instead of doing something wrong, because the burn could then get worse. "In other lessons you usually just have to sit there and listen to the teacher, at least in this lesson you get to join in as well." The assembly government has already written to St John Ambulance saying, "there are no plans to downgrade first aid as it is an important skill." The letter adds that the proposal at key stage three gives the example of "learning basic emergency procedures which young people can build on in the future". Comments on the proposals are now being studied, with recommendations being prepared for consideration after the assembly election. Welsh Conservative health spokesman Jonathan Morgan said: "Being able to provide the most basic forms of first aid and healthcare is something with which we should all become familiar. "The assembly government has a duty to ensure that this service continues and that the St John Ambulance is at the forefront of educating people about first aid." Plaid Cymru health spokeswoman Helen Mary Jones said her party took the St John concerns very seriously. "A Plaid government would make civic service in the community an integral part of the education curriculum and first aid would obviously be part of this," she said. Liberal Democrat education spokesman Peter Black said: "More and more subjects are being squeezed in under the PSE banner, which means schools are struggling to cram it all in, within the time available. "I agree that we need to review what is being taught in PSE, but I would hope that any review would take account of important life skills like first aid, to ensure that children continue to be taught them."